The natural progression from mechanical systems is to replace the mechanical key with an electronic token. This token can take the shape of a key, a card, a fob or can even be your own personal biometric information. This is where electronic access control systems have an enormous advantage over mechanical systems where each token, fob or biometric signature is unique and can be programmed or traced throughout the system. This means if an access control token is lost not only can it be removed from the system very easily, but if the token is used again it can raise an alarm. There are so many other possibilities that you can benefit from with our access control systems, including shift work, one-off visitor tokens, holidays and even cashless vending systems. All the necessary equipment needed to manage your access control system including camera, printer and encoder can be provided to you so that you can administer the system entirely yourself. We can provide training to you in the use of all hardware and software. Of course, we will still be available for maintenance, repairs and inspection. It is very normal that clients take control of the operation and management of their systems. In hotel systems it is important that the bedroom token is changed after every customer and this, to be practical, has to be done in a quick efficient way by the receptionist (see Salto systems). It is possible to use the system to create reports for attendance or even to locate someone within a large building based on where they last used their token. For highly sensitive areas (such as hospital drug stores or police / military armament stores) we can configure the system to prevent access unless two authorised people are present. 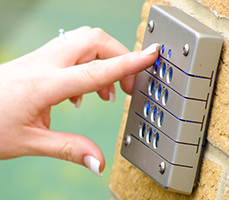 Access control technologies are advancing at a very rapid pace and can now even be a picture of the iris in your eye, the sound of your voice or more often than not your fingerprint. The control and management of systems is becoming much easier with well developed software that can operate over networks spanning (if necessary) the globe. 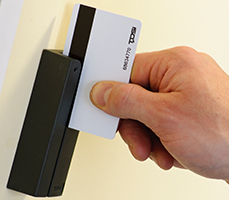 Your access control system can be integrated into other building management systems, meaning you can automatically adjust heating levels in empty rooms or buildings, switch lights on or off, and arm security systems. The system can monitor a single worker to provide a secure working environment or control access to car parks by reading your car's registration. "The Oliver family have used Keyways for many trouble free years and we appreciate the advice and service we get from them enormously, particularly when it comes to crime prevention aspects"